I've been an avid fan and loyal customer of the Bank of the Philippine Islands (BPI) since I opened a new account back in college. It's because they haven't given me any headache or whatsoever when it comes to my account opening, requests, and concerns. Throughout the years, my relationship with BPI has gotten more intimate, especially because I have been using it almost every day for my financial management. It has allowed me to get out more with their very easy-to-use 24/7 banking channels via internet, telephone and mobile phone. Want get out more also? 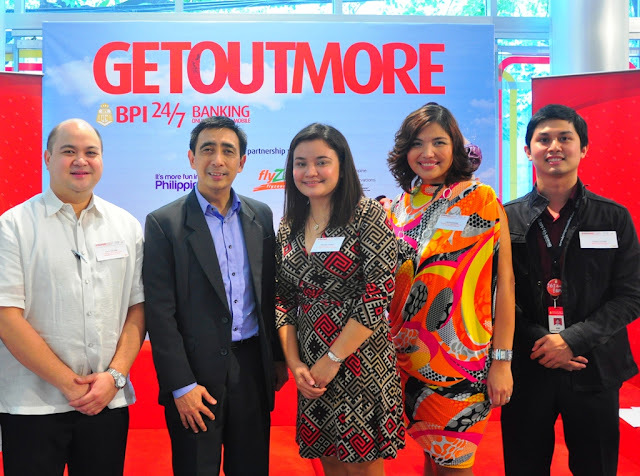 BPI has come up with an exciting travel and rewards campaign called Get Out More. This program is a joint partnership of BPI with Zest Airways and Philippine Hotel Reservations Service (PHRS). With the BPI Get Out More campaign, clients like me get a chance to win an all-expense paid trip for four to seven top destinations (Bohol, Davao, Boracay, Cebu, Legazpi, Iloilo, and Puerto Princesa) in the country, 3D/2N accommodations, and pocket money worth Php24,700.00 -- all these just by paying bills online, over the phone, or through the mobile phones. Everything's possible online now. I've been paying all my bills mostly through their online banking website or my smartphone app. It's more fun to do it that way since I can simply do it even when sitting, walking or driving (shhhh) whether at home, at work or at any vacation destination. It definitely minimizes the time and effort to walk towards a bank branch just to pay bills. So how can we Get Out More with BPI? Enroll any BPI, BPI Family or BPI Direct account to BPI's 24/7 banking channels (Express Online, Express Mobile or Express Phone). Pay monthly bills through any of these channels. Every Php50.00 bill successfully paid is equivalent to a raffle ticket. Two raffle entries will be awarded to the first qualified payment made to a unique merchant reference/account number during the promo period. Succeeding qualified payments will earn one raffle entry each (in the succeeding calendar month). Promo period is September 17 to December 31, 2012. To make it more fun, I encourage you to go to www.getoutmore.ph to check out further information about this campaign and to make your very own Get Out More video. Here's a sample video made by yours truly. Disclaimer: While this is a sponsored post courtesy of BPI, all facts written on this post are true and personally practiced in real life.